Green India-Clean India...........Solar significantly decreases a facility¡¯s GHG footprint, thereby contributing to a cleaner environment. Your utility, your state and the Government may have incentives that may significantly reduce the cost of your facility's solar system installation. ITG Energy is very pleased to offer solar technology developed and installed by the industry¡¯s leading solar solution provider. Going solar is easy. 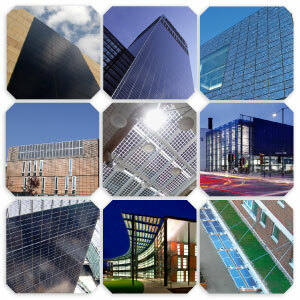 Find out if solar may be right for your facility today. Ask us about easy financing and leasing programs presently available in your area. ITG Energy's Single Mission: Provide a single service platform that delivers high quality clean energy solutions to the electric utility customer. Leadership: With more than 10 years direct experience in diverse technology and energy sectors, the leadership pioneering ITG Energy, formerly held senior management roles with high profile publicly held energy management corporations, overseeing sales and marketing, product and program design, development and management for each company¡¯s residential, small and medium businesses, large commercial, industrial, agricultural and institutional divisions and is credited for the strategic planning, design and development of highly successful energy efficiency and demand response programs in India. ITG Energy¡¯s leadership¡¯s contributions to the advancement of energy efficiency and demand response have been recognized..
A stand alone system varies in size and type, but 20Wp - 1KWp are quite common. The stand alone system is also known as an off grid system. 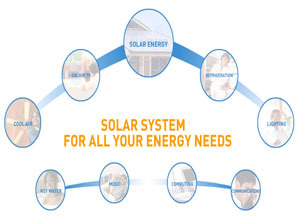 Off-Grid systems (standalone) use a photovoltaic system to supply electricity to a consumer unit directly or via a battery, independently of other energy sources. These systems are suitable for small devices and equipment not close to an electricity supply (e.g. street lighting, water pumps, radio and signal equipment). Fill in the details of your power requirements and email it to us at energy@itgsltd.com Upon receipt we will send you a quote. Solar Thermal The simple concept of making renewable energy cost-competitive with fossil fuel energy has driven ITG energy to engineer a paradigm shift in CSP technology, providing a cost-effective and scalable solution. ITG Energy partners with leading energy companies around the world to enable complete project capabilities, ranging from technology development and component manufacturing to power plant construction and operation. We specialize in the design and supply of solar energy and wind power systems for all remote applications and uses including: off-grid residential electricity, remote instrumentation, data acquisition, monitoring, water pumping or remote automation systems. We can design and supply a system to meet your exact needs and that includes all balance-of-system components.